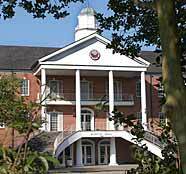 The University of Louisiana at Lafayette will administer the ACT Residual exam on July 16 at 8 a.m. in H.L. Griffin Hall. Students should bring $35 cash (exact amount) or money order, two #2 pencils and a picture ID. No pre-registration is required. Admission will be on a first-come, first-serve basis due to limited seating. These exam scores are reportable only to UL Lafayette. Scores cannot be used at any other university, nor can they be used for scholarship purposes or for NCAA eligibility. Students should report to the lobby of Griffin Hall at least 25 minutes early. This is the last ACT Residual to be given before the Fall 2005 semester. Results will be available July 19 after 1 p.m. in Lee Hall, room 115. For more information regarding admissions, please call (227) 482-6480.